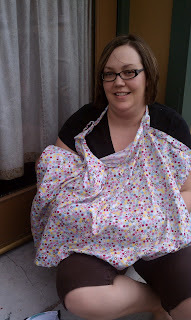 Mama Steph rocking her nursing shawl! The other day, someone sent me an article on "BIP" (breastfeeding in public). I am what many would consider to be a lactivist. In my non-blogging life I do research on breastfeeding, and so it is a passion in my life. However, I am not that person that will scream at someone for bottle feeding. The fact is, I know after 3 kids, that parenting is HARD work. After my first child, I really thought I "got" it. With my second child I realized that it was MUCH harder to have 2 children than 1 (imagine that). By my third, I threw all of my pre-conceived notions about parenting out the window. I realized that sometimes life happens. As I often say to new moms, "Sometimes, even in our house, we have cupcakes for breakfast." Of course, we do not have cupcakes every day . . . but there has been a time that the cupcakes were left on the counter and the kids got up BEFORE the grown-ups, and cupcake eating ensued. I tell you all of this because I want you, our readers, to know that here at MamaBreak we support ALL mamas. We support you regardless of HOW you feed your child. Because we KNOW it is hard work, and we are all doing our best. With all of that being said, we 100% support the mamas breastfeeding in public. You want to use a cover-- go for it! You do not want to use a cover-- go for it! You want to bottle feed-- go for it! You want to mix formula in front of us-- yes, you can even do that! Because of this-- BEING A MAMA IS HARD WORK!!! One thing I hate about the breast vs. bottle debate and the debate over breastfeeding in public (with or without a cover), is that we seem to forget that we are all moms, grandmothers, and/or women. We are all trying to do the best we can to raise our children in the best way we see fit! Why can't we SUPPORT one another, regardless of this decision. I always presume if someone decides to formula feed that they have been given the information they need and have come to an informed decision. And if I hear someone making a fasle statement about breastfeeding, I WILL correct them. But I know in my experiences with mothers, that there ARE women who cannot breastfeed. So here are my tips for FEEDING in public, because really, it does not matter how you do it. Be prepared for judgmental looks. No matter how you are feeding, SOMEONE is going to disapprove. Guess what? It is NOT the first time this will happen in your time as a parent. I believe feeding in public prepares us for the on-slaught of public scrutiny we will face later in parenting (like when your child is screaming HELP at the top of their lungs as you walk through a store-- because it is their favorite new word). Be prepared for snide comments. I stopped being critical of people who would make negative statements about me breastfeeding in public. People are always going to be critical of something you do (just wait until the first time you need to bring your child out and they refuse to wear anything but their pajamas/Halloween costume/snow boots in summer). I take a deep breath and wish them a good day. KNOW YOUR RIGHTS!!! This is mostly true for breastfeeding mothers (but ANY mother should know their rights). If someone attempts to kick you out of an establishment, share with them the laws in your state! I have them laminated on a card (even though I no longer breastfeed-- but to support other mothers). Don't know your state's laws? Here you go! Be STRONG and be PROUD of you as a mom! You are doing a GREAT job!!!! FIND SUPPORT!!! Find other moms to support you! It is the #1 way to build your confidence as a mom! If you feel uncomfortable without a cover, there are so many wonderful covers out there! We loved ones with a hooped top, so that we could still see the baby. We also loved using A & A blankets as a cover! SUPPORT ALL of the other Mamas out there!!!! If you see someone giving another mother a hard time for her feeding choices, speak up! We need to support each other as mamas-- not matter what the feeding choice is! LOVE YOURSELF! Mamas, we need to love ourselves no matter what! By loving ourselves and owning our actions, we are teaching our children to do the same. By loving ourselves we are teaching our kids to love themselves as well! 10 years ago, I was pregnant with my first child, and I would never have imagined that breastfeeding would become such an important issue in my life! We change so much as women when we become mothers! We support all of you, Mamas! VERY well said! I love your article! There aren't many people that are pro-breastfeeding but also ok with bottle feeding. i am one of those people, since I have done both due to not being able to nurse a few of my children. Thanks for this! Thanks for the laws link! People need to realize, YOU ARE FEEDING YOUR BABY! A baby has to eat when a baby has to eat but I do think the same modesty that I'd expect from anyone applies to the situation. When I had my son I fed him formula with a bottle cause I didn't know any better, to be honest. I was 2 weeks short of my 17th birthday and no one really felt like educating me on breastfeeding so I picked up the bottle and off we went. It was fine, he turned out perfectly O.K! When I had my daughter I was 15 years older and had learned a lot about breast feeding and wanted to give it a go, so I did, not really thinking that it would last too long, but actually it lasted over 2 freakin' years!!! (also a touchy subject with a lot of people I know!). I did supplement a little with formula when I went through a stage of not producing enough milk myself, and I was OK with that and my daughter never had any breast to bottle and back issues. I am all for breast feeding and breast feeding in public! I personally have issues with doing it myself though as I have a problem with people staring at me and I would rather not get stressed out so I would pump before I went out or use a cover or go somewhere quiet and out of the way to feed my child - which is stupid really, but it was what it was because I just felt awkward, which would probably not have happened if breast feeding in general was better understood and accepted as a perfectly normal process of the human creation! I really wish people would ease up a bit and get over themselves. Women have been told for years to cover up, while me are able to walk around shirtless. In some countries women walk about with nothing on and no shame, which is natural and normal and human! We weren't born with clothes, we defined them ourselves and put them out there in society - and unfortunately society has a way of making us feel bad about our bodies, any exposure and any public breast feeding with some people - mamas and passers by! I am all for people doing what they see fit for their children, but I don't think it should stop there. I think those that want to do something for their children, should want to allow for everyone else to also do what is right for theirs...live and let live and all that! Great article. I always hated the breast vrs bottle debate. Most important thing to remember is we are all doing what is best for our children no matter how we feed them. I am all for breast feeding, did it with both of my kids. However I do believe it needs to be discreet. A cover is a great thing. I ran into a store where a mom literally pulled her shirt down exposing herself to feed her child and I had a real issue with that. I fed my oldest in public all the time but never had to expose myself. My youngest would not do it, we always had to retreat to the car for him to eat if not at home. I think breastfeeding is beautiful. I tried with my son, and even tho I had lac nurses help, my body doesnt produce oxytocin on it's own and it was hard for me to produce enough milk. then he had jaundice, so I had to put him on whatever breastmilk would pump, some days no matter what all that would pump would be a few ounces, so that would get mix'd with formula. I do believe in modesty, there are times that you can face away from people that are sitting down at that public place. Or face towards your own family if you're exposing your whole breast. But when I say that, it usually goes into a huge debate about how its their right (when I've already admitted that it's a beautiful thing.) Usually it goes back to "My kid doesnt like a cover." while they still completely overlooked my thoughts on turning away from the public, even just a slight move of a chair, or sitting in the booth that isn't facing the other customers that were there first. ^^That'll teach me to try and type on my phone! :) I breast fed both kids exclusively. Both just over the year old mark. There were times feeding them in public was necessary but I did feel strange about it, although I don't really know why. I avoided public feeding and went to my car a lot when it was necessary because both kids were apt to pull covers off. I think breatfeeding is an extremely hard job and I think mamas shouldn't have to feel funny about doing it in public. Heck, in my college years I wore clothing out that revealed practically what a breastfeeding mom does and no one was complaining ;) just saying! I do prefer modest feeders, but wholeheartedly support women who breastfeed even if they aren't exactly conforming to my ideal or make me uncomfortable. They are making a great decision for their child and should be applauded for it. I breast fed both kids exclusively. Both just over the year old mark. There werr times feeding them in public was necessary but I did feel strange about it, although I don't really know why. I avoided public feeding and went to my car a lot when it was necessary because both kids were apt to pull covers off. I think breatfeeding is an extremely hard job and I think mamas should have to feel funny about doing it in public. Heck, in my college years I wore clothing out that revealed practically what a breastfeeding mom does and no one was complaining ;) just saying! I am huge supporter of breastfeeding and will breastfeed in public any day. Funny that the only time I received any negative comments was around family and friends. Thanks for the post. Being a Mom takes having tough skin.People will always judge the way you parent no matter what your choices are.Believe in yourself and the choices you make and don't worry about what others have to say. Their opinions don't even matter! The first time I ever breastfed my daughter in public was when she was about 2 months old and I had a cover on. This woman walked right up to me and said, "You CANNOT do that out here." I will also freely admit that there are times I do not use a cover. For example, usually when I am flying with my baby, and breastfeeding, it is WAY too much of a hassle to use a cover. I attempt to nurse on the side that no one is next to, but sometimes that just does not work. I had a woman SCREAM at me on a flight . . . and she was a ROW IN FRONT OF ME. I told her either my daughter would nurse or scream the entire flight. Sometimes you just have to nurse when the baby is hungry (imagine that). And often locations do not have a breastfeeding room (many stores and other establishments do not). I try to be as modest as possible when I do breastfeed, but if someone else wants to be less modest, more power to them! And if you prefer to feed in another way, HOORAY!!!! Great post, I also agree with a women doing what she feels is right for her and her child. Being a little discreet in order to make others with different opinions not uncomfortable is just being respectful. Then no one has reason to complain. Love your tips. I think if you are prepared for the snide remarks and nasty looks it will be easier to deal with or ignore. I breastfed both of my children many moons ago and I am so glad I did. Im a supporter too! I did bottle feed my first daughter, but my 2 year old I breastfed.